What quality of life do we owe the animals we depend on for food or biomedical research? What happens when the best interests of wildlife and human residents collide? The drive to answer questions such as these have driven the curriculum since the veterinary school’s earliest days—and are part of the reason that New England is considered the cradle of the American animal-welfare movement. In 1983, Tufts created the Center for Animals and Public Policy under the leadership of Director Andrew Rowan—now chief scientific officer of the Humane Society of the United States—to advance the study of human-animal relations. “The work of the center is based on the tenets that animal well-being matters, that animal and human well-being are linked, and that both are enhanced through improved understanding of human-animal relationships,” said Dean Deborah T. Kochevar. Since the M.S. in animals and public policy was first offered in 1995, the program has graduated more than 200 students armed to lead conversations about improving the lives of animals and people. This summer, the faculty of the center will hold a one-week course, open to the public, to examine some of the high-profile animal issues explored in the M.S. program. All D.V.M. students, meanwhile, take courses exploring human-animal relationships, legal and ethical issues in veterinary medicine, and euthanasia. These courses, and many cocurricular classes, are offered in the Animals Welfare, Ethics and Policy Signature Opportunity, which builds on the legacy of the school’s early leaders, including the late Dean Franklin Loew and late Professor Elizabeth Lawrence, a pioneer in animal welfare. The D.V.M. program is also a national leader in reducing animal use in the teaching of anatomy, surgery, and clinical procedures. Historically, veterinary students practiced on animals euthanized after surgery or before anatomy lessons. However, Tufts students objected, and M. True Ballas, V00, convinced faculty to study whether the same educational benefits could be gained by using cadavers donated by pet owners. In 2005, Cummings School became the first veterinary school in the U.S. to move entirely to a willed-body-based program for teaching small-animal anatomy, a policy since adopted by all thirty veterinary schools in the U.S. This progressive change informed the 2008 creation of the Shelter Medicine Program, set within the Luke & Lily Lerner Spay/Neuter Clinic. The curriculum now requires students to learn common procedures by performing supervised free or low-cost surgeries on shelter animals. Cummings School has also taken the lead in laboratory animal medicine. The school’s first two deans were trailblazers in the field and its benefactor, Henry L. Foster, V83, H92, made major improvements in the quality control and commercial availability of common rodent models. The school has long looked to improve the lives of animals in laboratory settings, including working to reduce, refine, and replace the use of animals in research. Tufts is the only veterinary school that offers a degree combining a D.V.M. with an M.S. in laboratory animal medicine, a program that trains veterinarians to advocate for lab animals and ensure that all welfare regulations are followed. 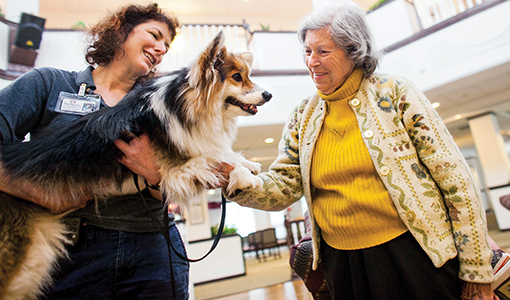 Founded in 2015, the Tufts Institute for Human-Animal Interaction seeks to determine how animals help us better handle physical and emotional stress, commit to fitness and educational goals, overcome disabilities, and recover from psychological trauma—as well as how humans, in return, affect animals’ well-being. The initiative breaks down traditional barriers among fields—veterinary and human medicine, engineering, and psychology—and draws on the expertise of faculty, staff, and students from across Tufts schools. They work on projects ranging from studying how therapy dogs can help comfort children undergoing treatment for cancer to saving the last elephants in the wild.